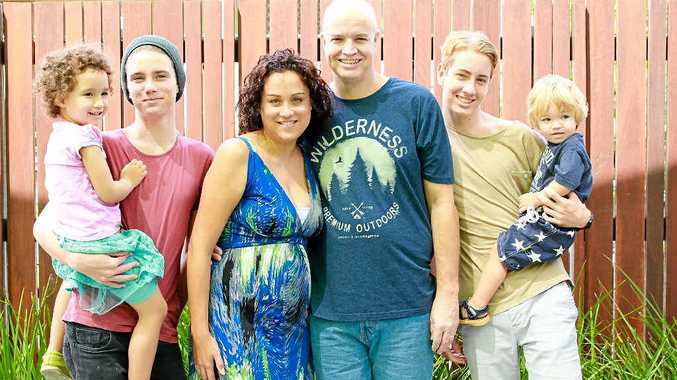 A POSITIVE attitude and precious family time has helped a Sunshine Coast father through a shock cancer diagnosis, which all started as a niggling mouth ulcer. Damien Holt is about to start his sixth cycle of chemotherapy and is awaiting a bone marrow transplant in his brave fight against acute lymphoblastic leukaemia. His diagnosis is something so strange and dramatic, it came as a complete surprise to him, his wife and four children. The Daily first told of his diagnosis in February, which resulted in an outpouring of support from the local community for the Holts. The Coast businessman visited a chemist back in January, seeking relief from what he thought were mouth ulcers. He asked to be prescribed a mouth wash or a similar treatment, but was instead instructed to visit his GP, where he underwent a series of blood tests. The next day, he was diagnoses with leukaemia and underwent his first round of chemo just a few hours later. Damien's wife Pamela said she had admired his strength, bravery and positive outlook on a situation that no one expected. The entire family - Pamela and children Levi, 23 months, Gemma, 4, Toby, 15 and Nathan 16 - have moved south to be with Damien as he undergoes treatment. Visits from the kids are occasional and welcomed breaks from hospital life. "The little kids are just heartbroken to not have their dad there when they wake up in the morning," Pamela said. "Gemma asked the other day what chemo was, she had been hearing that word so much, so we told her it was medicine in bags that daddy needs to get better. "Levi is only two and doesn't understand what is going on and has had to change daycare as well. "We will be lucky to be back at the Coast by Christmas," Pamela said. The family is calling out for more bone marrow and blood donations in the wake of Damien's diagnosis. Pamela estimates Damien has needed more than 50 blood donations since he started treatment. The Holts have both had to give up work and have had to shut their businesses while Pamela acts as full-time carer for Damien. A donation fund has been set up for the family to financially help them through the difficult year. Visit http://www.mycause.com.au, search "Damien Holt"